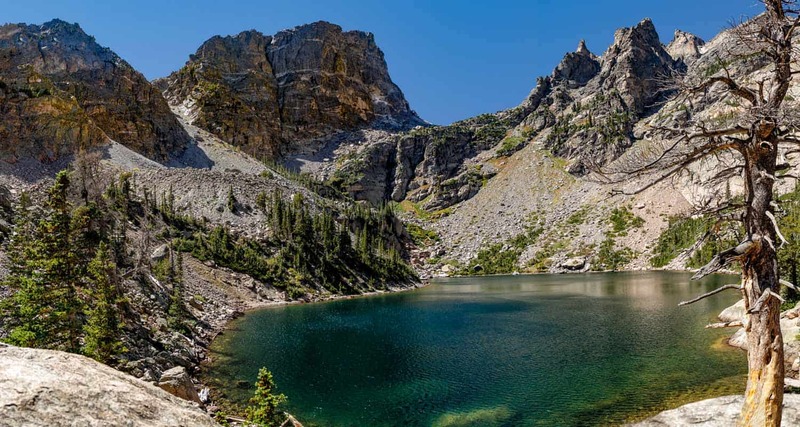 The hike to Emerald Lake is one of the most accessible hikes in Rocky Mountain National Park. If you are visiting RMNP, and have limited time to visit, the trail to Emerald Lake is an excellent option. You’ll pass both Dream Lake and Nymph lake before you end your hike at Emerald Lake and it’s stunning views of Hallet Peak. 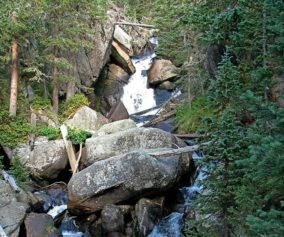 For more information on this hike, explore the trail profile which includes trail map, driving directions, and helpful tips and resources to enjoy this Colorado hike in Rocky Mountain National Park. 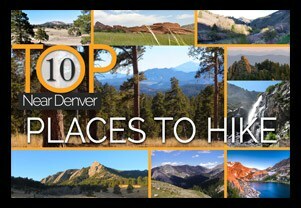 A Colorado Hike with a lot of bang for the buck. What we mean is that there is a lot to see on this 1.8 miles stretch of trail. 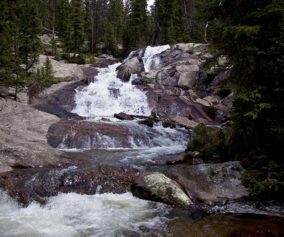 Starting at Bear Lake, you’ll take in a total of four Colorado lakes, and pass a small waterfall near the top of the trail. 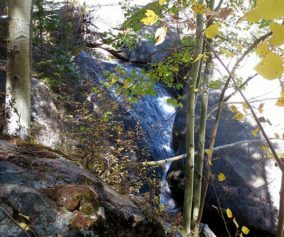 If you are looking for a handicap accessible hike, the trail around Bear Lake Loop hike may be the most beautiful, handicap accessible trail in Colorado. In the winter, the hike up to Emerald makes for a perfect snowshoe hike. The trail to Emerald Lake begins at the Bear Lake Trailhead (driving directions). In the event that parking at Bear Lake is full, you’ll then need to park at the Park & Ride near the Bierstadt Trailhead and take the bus into the trailhead. This service runs 7am to 7PM and more information on the RMNP shuttle bus routes can be found at this link. The trail to Emerald Lake is located on your way to Bear Lake, off to the left, just before reaching the shore viewing area of Bear Lake. 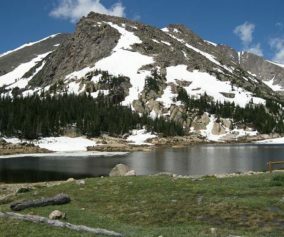 For conditions at Emerald Lake, see the Rocky Mountain National Park Trail Conditions page. Get to the Bear Lake trailhead early: We say this for almost every hike near Denver, but the Bear Lake Parking area is probably the busiest in the park. If you can’t get there early, just take the shuttle from the lower parking area. The Wildlife: We have seen a beautiful black bear in this area on one occasion. It just saw us and ambled away. 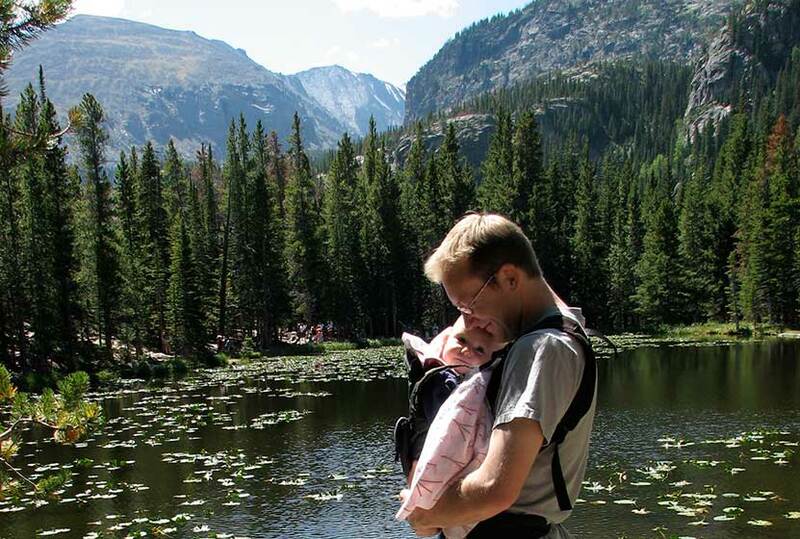 As with any hike where there are a lot of wildlife, keep small children within sight at all times. On your way out, be sure to stop around Moraine Park and watch the Elk. 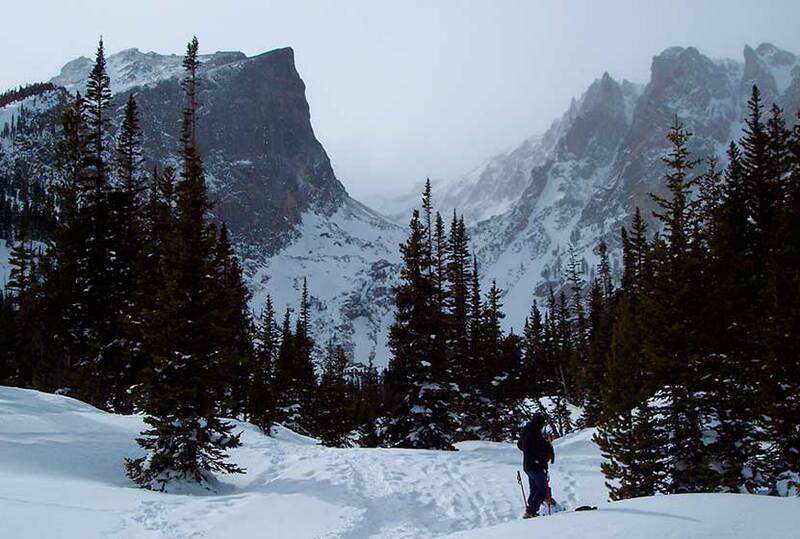 Snowshoeing to Emerald Lake In the winter, this is a Colorado wonderland and a very accessible trail to snowshoe. You can rent snowshoes for a great price at The Colorado Mountain Shop in Estes Park. Photo: We would like to express our gratitude to Tim Lumley for sharing this great photo of Emerald Lake in RMNP. this is a fun hike. My hubby and I like to go up and spend the day exploring! Very pretty! 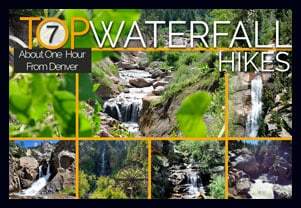 This is a great hike that our family enjoys going on. This is the default hike that we take out of town visitors on as it is very accessible and beautiful! Enjoy going on this hike when there is still snow on the ground, as the lake contrasting with the white is amazing. Not to difficult of a hike and you might even hear some elk. 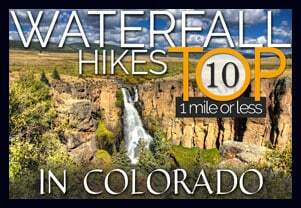 If you’re staying near Estes, or just doing a day trip from Denver, this is a great moderate at best hike. Pretty scenery and nice vistas. Finish it off with a visit to Ed’s Cantina in Estes.